Home » How to ? » How to Cook Sweet Potatoes? Sweet potatoes were first introduced to the rest of the world when Columbus brought them over from the island of Saint Thomas. You can bake ‘em, boil ‘em, microwave ‘em…. Just about anything you can do with a potato, you can do with a sweet potato. Below are four ways to go. Bake sweet potatoes in their jackets. Wash, cut off the ends and bake in a preheated 400 degree F oven for 40 to 60 minutes (depending on the size of the potatoes and how firm you want them to be). Bake the potatoes on a baking sheet; the sugars in the potatoes can drip out and burn on the floor of your oven. Roast peeled chunks of sweet potatoes with onions in a 400 degree F oven for 40 to 60 minutes. Drizzle a little olive oil on the potatoes first. Boil or steam peeled or unpeeled sweet potatoes, either cut into chunks or not, until tender. The time will vary depending on the size of the potatoes or chunks – from 5 minutes for small chunks to 30 minutes for whole potatoes. Mash cooked sweet potato and blend with butter and a little milk for a smooth puree. Add brown sugar plus cinnamon, cloves or ginger if you wish. 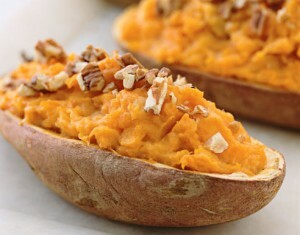 A well-cooked sweet potato will mash almost instantly with just a fork. How to delete a Gmail or google account? What is the most common password? Previous: Yahoo opens New Yahoo Meme!